The cataclysmic eruption of the volcano of Thera, some 60 miles (100 km) north of Crete, must have seriously disrupted the tranquility of Minoan life. The eruption took place while the Late Minoan IA style still flourished—about 1500 B.C. The extraordinarily rich settlement on Thera itself seems to have been abandoned at the first signs of volcanic activity, and probably the initial loss of life was relatively small. However, the eruption would have generated a devastating tsunami, or sea wave, and harbors on the north coast of Crete and any shipping in them must have suffered damage. The fallout of ash downwind from the cloud, which was projected into the upper atmosphere, must have been poisonous to vegetation.Oceanographic research has indicated that the wind was northwesterly, so that central and eastern Crete, together with Rhodes, would have suffered considerably. 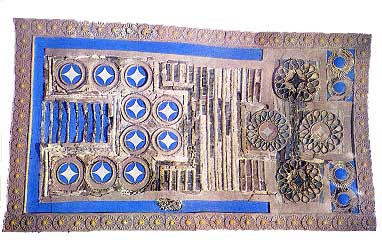 However, attempts to attribute the Minoan collapse solely to this cause encounter the difficulty that the main destructions in Crete fall at the end of Late Minoan IB, or about 50 years later. Possibly the natural disasters so weakened the Minoan kingdoms that they were unable to resist an invasion of Greeks from the mainland. About 1380 B.C. the palace of Knossos, which alone of the great palaces still survived, was destroyed by fire. Subsequently, Crete would seem to have split up into small independent units. At least some of these seem to have remained under Greek rule, for jars bearing Linear B inscriptions found on the mainland have been shown to be of Cretan origin. The final decline of the Minoan civilization occurred about the 12th century B.C. 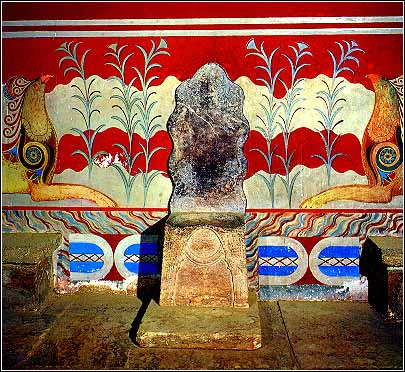 The later Greeks retained no accurate information about the Minoans. They believed that King Minos of Knossos had been the first man to found an empire on sea power, and great technical achievements were associated with the name of his engineer, Daedalus. The Labyrinth that he was supposed to have built at Knossos to contain the Minotaur, a fabulous monster half man and half bull, remained the emblem of the classical Greek Knossos and appears on its coinage. Some scholars have thought that the Labyrinth is a confused recollection of the complexity of the Minoan palace plan.